Toscanini once famously put a Met diva in her place by telling her that the only stars he knew were in heaven. He was wrong, of course. Stars have been a top priority at the Metropolitan Opera ever since the company opened for business in 1883, and the first weeks of the season are always a good time to scan the skies and see if there are still a few bright points of light left shining. Most critics would rank Marcelo Álvarez, Plácido Domingo, Renée Fleming, Angela Gheorghiu, Susan Graham, Bryn Terfel, and Violeta Urmana among today’s operatic elite, and these seven étoiles have been adding whatever luster they can to the Met’s current performances. Whether they represent a new standard of golden-age singing or the feeble remnants of a tottering art form depends upon which opera fan you talk to. Even a novice could tell who the perceived stars were at the Met’s opening-night gala. Three staged acts from three different operas made up the program, and the repertory choices were clearly meant to accommodate the most popular among the reigning favorites by giving them all at least one showy solo moment. Bryn Terfel got the most plums: two arias as Figaro in Act One of Mozart’s Le Nozze di Figaro and two more monologues as Scarpia in Act Two of Puccini’s Tosca. No doubt the Met wanted to get as much value as possible from the hugely popular but reclusive baritone, who rations his operatic appearances these days and is seldom coaxed away from his farm and family back in Wales. 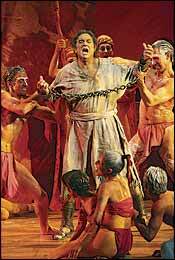 When he does consent to appear, Terfel projects a star quality that is never in doubt. In both roles he stalked his women like a born stage animal, lovably bearlike as the quickly aroused Figaro and evil to the core as the depraved Scarpia, while easily modulating his million-dollar voice to suit every mood. Those who missed this one-time-only appearance can still check out his repeat performances as Falstaff in Verdi’s final masterpiece, a quicksilver impersonation that seems more ingeniously inventive each time it takes center stage. Does performing come too easily to Terfel? Despite his awesome natural gift and attention to detail, there’s still a casually manipulative aura about his stage persona that suggests a singer who, somewhere, deep down, yearns to be a music-hall entertainer. Yes, yes, I suppose I’m being ungrateful about one of today’s most beloved vocal artists. So while I’m at it, let me register another complaint, about all those careful adjustments of score pitch that must be made to help Plácido Domingo get through a role. It’s always done for the great man now, but few seem to notice or care much. Whatever downward transpositions had to be taken during the evening’s concluding sequence, Act Three of Saint-Saëns’s Samson et Dalila, Domingo’s tenor remains amazingly secure within the low, narrow range where he clearly feels most comfortable and can still produce plenty of burnished tone. Besides, a Met gala without his presence would be unthinkable. Angela Gheorghiu’s appearance in Act Two of Tosca apparently made her fans happy. She commands a lot more star power now than when Met general manager Joseph Volpe once insisted that she wear the wig specifically designed for a production or not sing at all; this time she was allowed to bring her own fire-engine- red gown, which had “diva” written all over it. Other than that, Gheorghiu was an oddly underpowered Tosca, which suggests that perhaps her lyric soprano doesn’t stretch this far or that she is not really the fiery, temperamental singing actress she would like us to believe. There were some pretty vocal moments and lots of flouncing about the stage, but the character touches that make Tosca such an intriguing personality and drive her to murder were simply not there. I had a better time the next night, at the revival of Massenet’s Manon. What a relief to hear Renée Fleming sounding something like the singer she was a decade ago, before superstardom arrived and “The Beautiful Voice,” “America’s Soprano of Choice,” and all the other silly promotional labels were glued onto her. Her deluxe instrument is right now at its ripest maturity (savor the moment—it never lasts long enough): an easily produced, warmly vibrant, smoothly textured voice responsive to anything she cares to ask from it. Most of the annoying cooing mannerisms, glottal exaggerations, pitch bending, and annoying rubato excesses that have disfigured her singing lately have been toned down for the current Manons, and her most musical instincts come to the fore. With Marcelo Álvarez as an elegantly considerate Des Grieux for her duet partner, Fleming takes her place as one of the Met’s great Manons, in face, figure, and charm of manner as well as vocal distinction. The Met’s current cast for Strauss’s Ariadne auf Naxos is even better news, a strong lineup beginning with the title role: Violeta Urmana, the first Met Ariadne since Leonie Rysanek who can burn up the stage with a thrilling dramatic intensity that matches her vocal brilliance. As the ardent young Composer in the Prologue, Susan Graham is so touchingly vulnerable and expressive that she almost makes me forget that Strauss wanted the part sung by a lyric soprano. And at the first performance, the audience was clearly delighted to stop the opera in its tracks to proclaim the debut of a new luminary whose career is barely three years old: German coloratura Diana Damrau, who tossed off Zerbinetta’s fiendishly stratospheric aria with staggering precision and the stage savvy of a veteran. Perhaps even Toscanini would have called this a star turn.